Corporate earnings are expected to contract moderately this quarter (-1.8%) for the sixth consecutive quarterly decline. However, much of the data we follow improved through the summer, suggesting potential for upside surprises. We update our forecast for the WCA Fundamental Conditions Barometer which stands near 70, reflecting improved near-term growth and lessened recession risk. 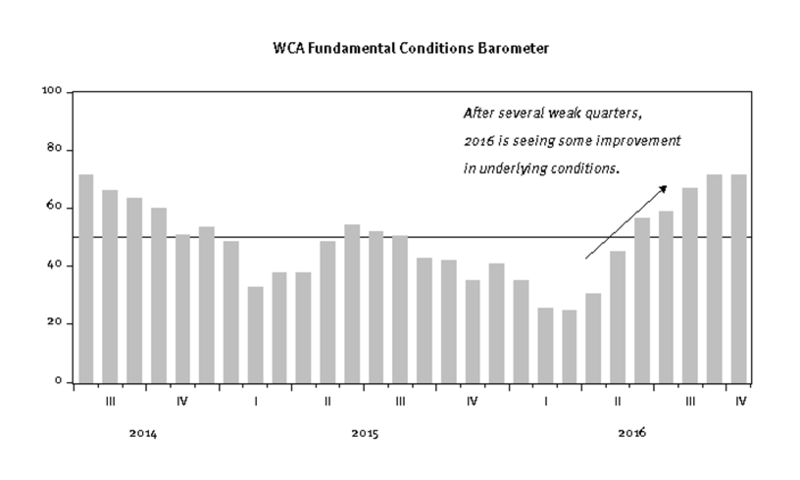 The WCA Fundamental Conditions index showed steady improvement in recent months (Chart A), and our near-term forecast (Chart B) continues to track above 50. 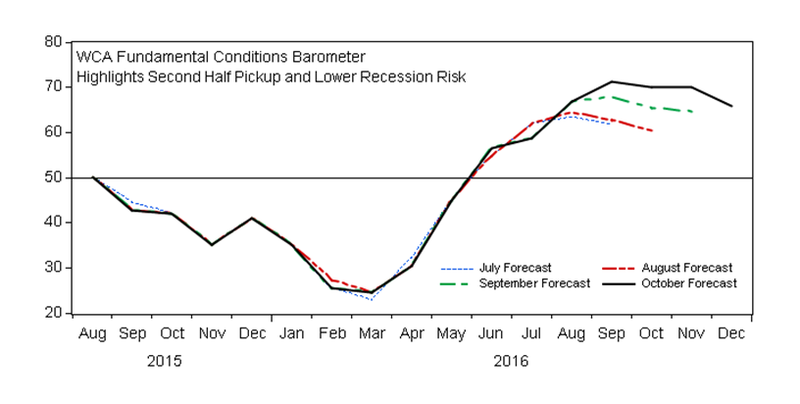 Barometer readings above 50 imply a higher probability of continued growth, with lessened near-term recession risk. 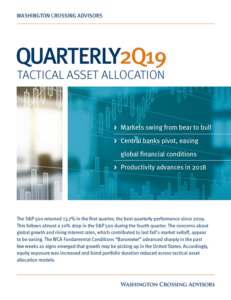 The pickup in the barometer supported our short-term tactical call to increase equities and reduce bonds beginning last June. Bond exposure remains underweight today (and within bonds, duration is shortened), and we are overweight in corporate bonds versus Treasuries. 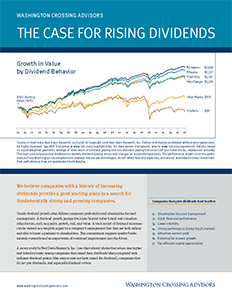 On the equity side of the equation, our capital market assumptions lead us to remain overweight in large cap domestic growth stocks over foreign equities. We are also overweight gold, while underweight in REITs versus policy allocations. Apart from last week’s weaker-than-expected retail sales report, most of the demand side of the economy has been decent. Rising employment and wages are helping to feed final demand, which has been growing near 2% through most of the expansion. However, we are beginning to focus more on supply constraints in the economy coming from falling productivity, lackluster investment, and slipping labor hours. This combination could pose a risk into 2017-2018. If productivity, labor, and output potentially slow while demand holds up, remaining slack will be absorbed quickly. The potential then would exist for a combination of wage pressure accelerating a downward adjustment to profits, while simultaneously putting additional pressure on the Federal Reserve (Fed) to get more aggressive on rates than currently anticipated. While this is not our base case forecast, the risk of such an outcome needs to be monitored carefully, especially given mounting constraints on central banks. The options available to central banks a few years ago are not as obvious today. Questions about the efficacy of asset purchases, rising political opposition to easy money policies, fear of stoking asset bubbles, already negative interest rates, high levels of global private debt, and technical issues regarding managing the supply of available bonds for purchase are all conspiring to pressure central banks to back away from further aggressive easy money. While pressure may increase for some further fiscal stimulus globally, such policies are going to be hard to push through absent threat of recession or lapse into deflation. Therefore, the policy-drivers for the economy that dominated market performance since 2009 are not as strong as they once were. Instead, continued growth is increasingly tied to an improving private sector. With some momentum behind us, what would we like to see headed into 2017? A pickup in private investment (which is lacking) would go a long way to help carry growth into 2017 by energizing the lagging supply side of the economy, helping to boost profits, and boosting the productive capacity of the economy. This would be the good way to extend the improvement seen in recent months and would provide a much needed boost to earnings growth. LONG-RUN STRATEGIC POSTURE: Our long-run forecasts lead us to overweight large cap domestic growth stocks, high-yield corporate bonds, and gold in the diversified “core” of portfolios. Underweight positions in “core” are long-term U.S. Treasuries, foreign developed equities, and REITs. The allocation in the short-term tactical “satellite” portion of portfolios currently stands at 60% equity / 40% fixed income.